Computacenter has signed a sponsorship deal with Pro Cycling Team NetApp-Endura for the second half of 2013 including two major Pro Cycling races, the Vuelta a España and the Tour of Britain. Look out for our Computacenter logo the sleeves of the team’s race shirts and on the support cars following the race. You can catch all the action on ITV and through the extensive media coverage – TV, online and print. Vuelta a Espana will reach its dramatic finale on Sunday the 15th September in Madrid, while the Tour of Britain will kicks off in Peebles, Scotland on the same day. This year’s Vuelta a España is considered to be one of the most difficult three-week races of the past couple of years. With 11 mountain finishes, it will demand quite a bit from the riders. For the first time since 2003, the route crosses the border into France with in a mountain finish in Peyragudes. 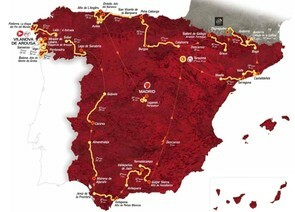 The 68th edition of the race started on the far western edge of the Iberian peninsula, called the “end of the world,” with a team time trial on the 24th August and the routes have wound their way through Galicia, south to Andalusia, where the first Hors catègorie mountain, the Alto de Hazallanas (1,680 metres), challenged the riders during the 10th stage. After a day of rest, the course then took riders from the Sierra Nevada back north to Aragon. A hilly time trial during the 11th stage wraps things up in the northeast of Spain, before heading to Andorra with a climb up the Collada de la Gallina. From Andorra, the route leads through the Pyrenees to Peyragudes, a ski station three kilometres behind the famous Col de Peyresoude. The final three days before Madrid will no doubt deliver an exciting race with three consecutive mountain finishes: Peña Cabarga, Monte Naranco and the pinnacle stage, Alto de l’Angliru. The 13-kilometre climb up Angliru, with its incline of nearly 24%, may shake up the general classification a ,bit before the finale in Madrid on 15 September ends in a sprint. GO TEAM NETAPP – ENDURA!! !